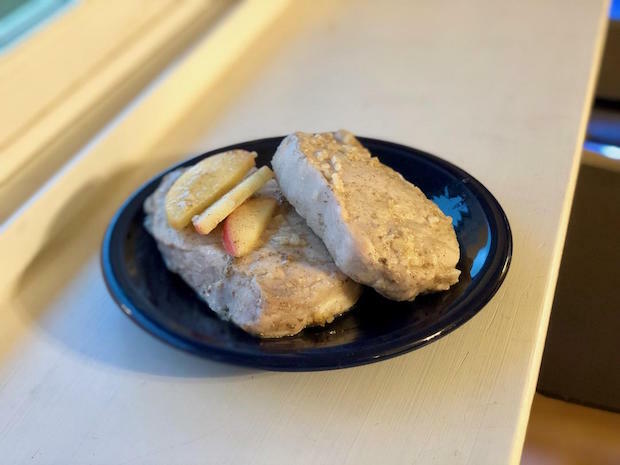 I posted about a recipe I made up for apple cider pork chops last month and had a few requests to share it, so here we are! I’ve made the recipe a few times now and finally wrote down exact measurements and photographed it yesterday and came to the conclusion that pork just isn’t very photogenic. 1. Slice apple thinly and line the bottom of a 9×13 inch glass baking dish with slices. 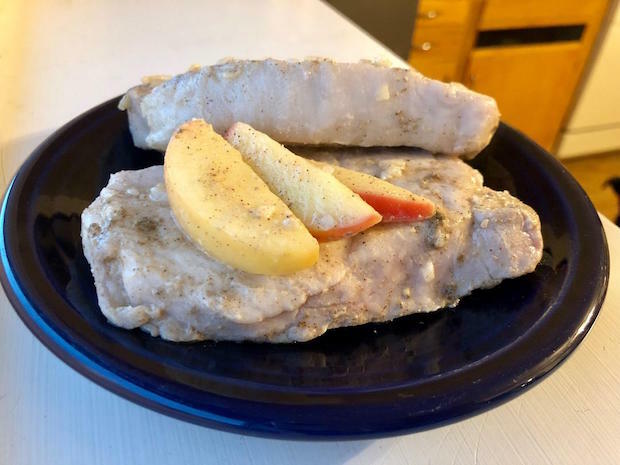 Lay pork chops on top of apples. 2. Combine apple cider vinegar, minced onion, mustard, sage, and cinnamon in a small bowl and whisk to combine. 3. Pour vinegar mixture over pork chops and sprinkle with salt and pepper. 4. Cover and refrigerate for at least one hour or up to 24 hours. 5. When you’re ready to cook your chops, remove them from the refrigerator and preheat oven to 350°F. 6. Bake for 30-35 minutes, or until pork reaches an internal temperature of 145°F. Enjoy! Some things just photograph so poorly! Doesn’t make the recipe any less delicious though. So true! It’s usually meat, too! This is definitely deceiving… not pretty, but pretty tasty! Pork isn’t photogenic but this sounds delicious! Thanks for sharing the recipe. It really isn’t photogenic, but I’m so glad it tastes good! I’d rather have it taste good than be photogenic, haha. Thanks, Amy! These look tremendous & beautiful too!! Thanks for sharing, Allie! Aww, that means so much coming from a foodie! Thanks, Mackenzie! This sounds delicious! It still looks good even if it’s hard to photograph pork. Some things just don’t look amazing on camera, but what matters is that they taste good! And it’s easy to tell that this would taste amazing. 🙂 Thanks for sharing! Aww, thank you so much Courtney! So true, as long as it tastes good, who cares how it photographs!